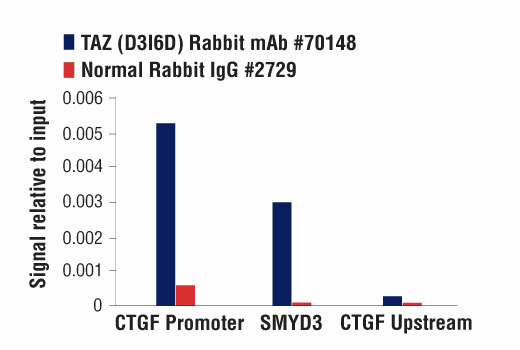 TAZ (D3I6D) Rabbit mAb recognizes endogenous levels of total TAZ protein. 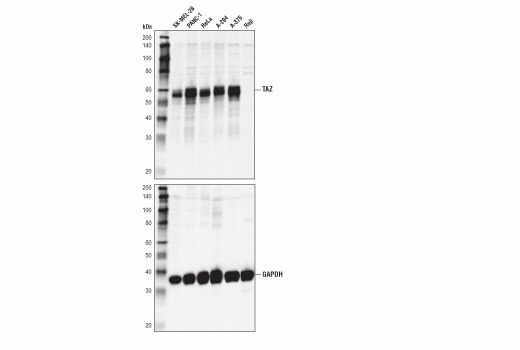 This antibody does not cross-react with YAP protein. Monoclonal antibody is produced by immunizing animals with a synthetic peptide corresponding to residues surrounding Ala200 of Mouse TAZ protein. TAZ is a transcriptional co-activator with a PDZ-binding motif that is regulated by its interaction with 14-3-3 proteins (1). 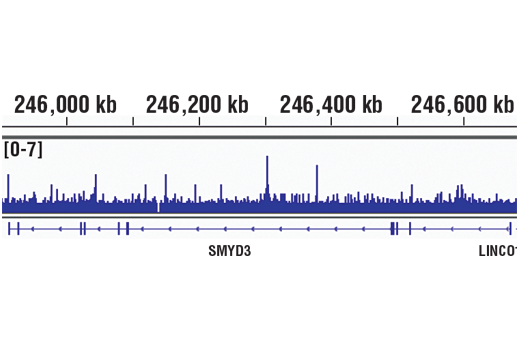 TAZ shares homology with the WW domain of Yes-associated protein (YAP) (1). TAZ is proposed to modulate the switch between proliferation and differentiation of mesenchymal stem cells (MSC) via interaction with transcription factors Runx2 and PPARγ. This process is critical to normal tissue development and the prevention of tumor formation. Due to its role in determination of MSC fate, TAZ may have clinical relevance to several human diseases caused by an imbalance of MSC differentiation (2,3). TAZ is negatively regulated via phosphorylation by LATS1/2, core kinases in the Hippo signaling pathway that controls stem cell development, tissue growth and tumor development (4). Kanai, F. et al. (2000) EMBO J 19, 6778-91. Hong, J.H. et al. (2005) Science 309, 1074-8. Hong, J.H. and Yaffe, M.B. (2006) Cell Cycle 5, 176-9. Lei, Q.Y. et al. (2008) Mol Cell Biol 28, 2426-36.